Uber allows the passenger to book the nearest Uber ride through a smartphone and then track the vehicle on a map as it approaches the location. Uber updated its terms and conditions allowing for the Uber driver to see your location. Even with this, drivers get a rough time getting to your specific location. Uber is now testing a new feature called “Suggested Pick Ups” that recommends the easiest pick up points for your ride. The feature works when dragging the “Set Pick Up Point” pin to input the pick up location by informing the passengers that the can save time at the suggested location. It then proceeds to show places nearby, where the driver would quickly pick them up. Users can then pin to the green dots, which suggest the pick up points and walk there to reduce the wait time for their Uber ride. Testing for the new feature is taking place in San Francisco, which is also where Uber is headquartered before roll out to other markets. 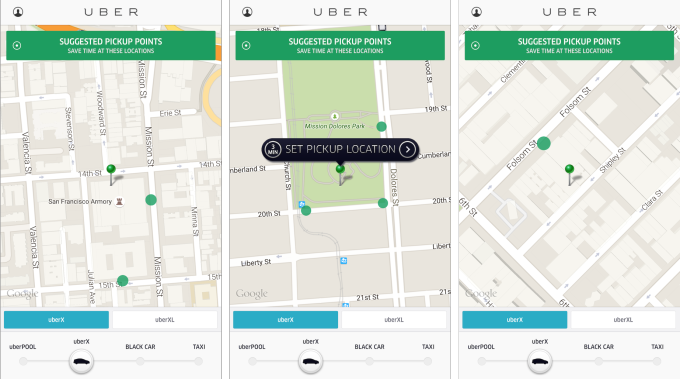 To successfully implement the new feature, Uber will use data from past pickups to power suggestions for where drivers can quickly pick passengers. The feature is a particular good solution to the problem many Uber users will attest to, a driver not finding your exact location. Uber’s major competitor offers a similar service through Lyft Line HotSpots where you can walk in and get a cheaper ride.